When applying for a study abroad program, I made sure to pick my dream destination, Florence, Italy. I knew coming to Florence would be an adventure in itself, and that the city would have a lot to offer. Luckily, Florence is in a great location and is surrounded by many other beautiful cities and countries. In order to take advantage of my abroad opportunity, I have made it a point to not only explore Firenze, but travel to other destinations as well. In doing so, I have come across some handy tips that can make the stress of traveling a little less stressful. My first tip is to write out a list of all your desired destinations you would like to travel to while abroad. 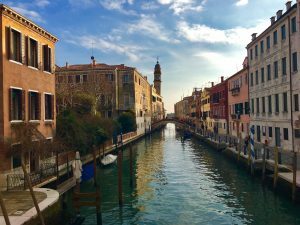 Europe is very diverse, with many unique travel destinations, so if you are anything like me, your list will be much longer than the time you actually have to devote towards traveling. But this list will allow you to see where you want to go, and help you prioritize your most desired places to see. 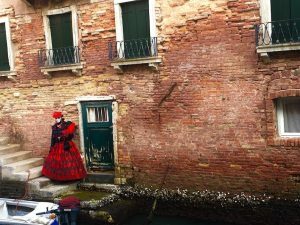 A photo I captured of someone fully dressed for the Venice Carnival. My second tip is to know your budget and how much money you can set aside for your travels. This can go hand-in-hand with your list of destinations because it will allow you to see what you can afford, and depending on your budget, narrow your list down to the places you are just dying to explore. I know for myself, once I looked at my budget, I made a new list of the top five places I wanted to visit while abroad. 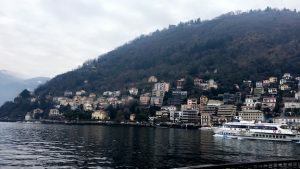 This photo was taken while I was on the boat tour of Lake Como. Next, pick your style of traveling. I discovered there are two different ways you can travel; one is independently, and the other is through a travel company. There are multiple travel companies such as Smart Trip, Florence for Fun, and Bus2alps that are all really great companies to travel through. When booking with companies, you pay a flat rate for the destination of your choosing, and they take care of the rest such as transportation and hostel. It really takes the burden off of you trying to figure out everything on your own such as transportation to and from the airport or train station, and where you are going to stay at while in the city. This also is usually the cheaper solution, and you never have to travel alone. These companies offer trips to a wide selection of destinations and are a very stress free way to travel. However, there are also great ways to travel independently without the help of a company. My first suggestion would be to find a travel buddy, or travel group. Although not required, it is advised to not travel alone. There are many cheap ways to reach your destination whether it’s by bus or train, which are most of the time very affordable, or by using Ryanair or Skyscanner for cheap flights to and from different countries. I have used both styles of traveling depending on the destination of my choice and what was most affordable. Both ways are great experiences and you can decide which best works for you. 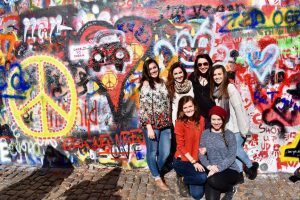 At the famous John Lennon wall in Prague. My final tip is don’t forget to spend time exploring your home city. It can be really easy to book up all of your free weekends to go travel to other places, but in the long run, you should leave a few weekends free to get to know your temporary home. 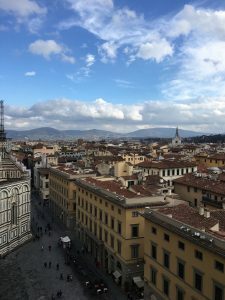 I love Firenze and I don’t want to regret not getting to know my way around the city, or meeting the locals, so I have kept various of my weekends dedicated to roaming the streets of my dream city. A beautiful view of my home away from home, Firenze! Chloe is a spring 2017 SAI Florence student from Washington State University.